Today's EKOS poll contains bombshell numbers in Québec: Tories 28%, Liberals 24.5%, NDP 23.8%, Bloc 16.8%. Due to the concentration of the Conservative (around Quebec City) and Liberal (on the island of Montréal) votes and to the weakness of the Bloc, the NDP might still win the most Québec seats with these numbers - I get NDP 28, CON 23, LIB 19, BQ 8. But if the NDP is still dropping in Québec, it has plenty of time to get below 20% and lose virtually every seat there. At this point, though, it is important to take a deep breath and remember that this is just one poll with a sample of 337 decided and leaning voters in Québec. Equally important in the EKOS poll is the 6.6% Liberal lead in Ontario. The four pollsters that have released results from after the TVA debate all show a slim Liberal lead there: Abacus 7%, EKOS 6.6%, Ipsos 3%, Nanos 2.8%. 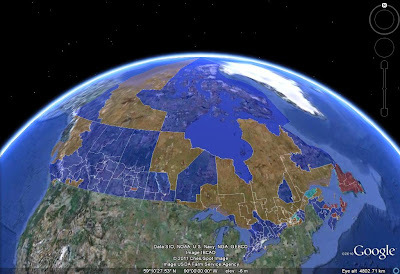 This would dash virtually any chance of a Conservative majority - even if the Tories win 20-25 seats in Québec. Hard to believe Ekos. Their numbers are consistently out of line with most of the Polls. Trying to prop Harper??? I'm sorry, but you website is a bit of a joke. It's like all those republicans who thought they were going to win a landslide in 2012. 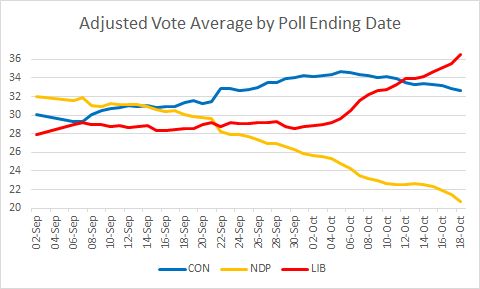 I don't know where Ekos is really getting their polls numbers, but all other polls show the NDP still in the lead, followed by the liberals in Quebec. That's multiple polls with with larger sample sizes. I do worry about turnout effecting the seat, but that's the only thing you have going for you. All of these are well within the margin of error. You're right that earlier in this election cycle, EKOS did tend to put the Liberals lower than other pollsters, but that appears to be true of IVR pollsters in general. I suspect that EKOS is now closer to the average because they moved to a hybrid methodology. Dardy: Indeed, the best guess is that the NDP is still leading in Québec. If you look at my current projection, it's still at 45 seats there. 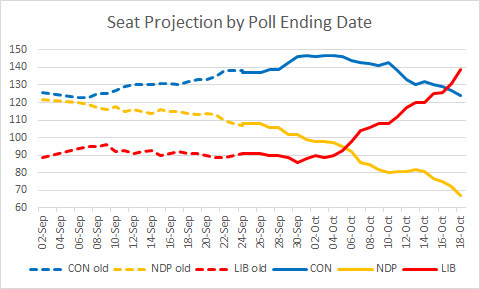 But I report every poll, and EKOS has been the first to pick up on trends in the past. As for partisan affiliation, if you've been following this blog and read between the lines, it should be clear that I'm not a Conservative. Also, Frank Graves (the EKOS guy) is very progressive - just go look at his Twitter feed. Darrell Bricker (the Ipsos guy), whose polls have been relatively low for the Tories except this week, is a Conservative. It's your right to let your partisan leanings dictate how your analyze the numbers. But I believe that such an approach is "a bit of a joke," to borrow your language.